Dog Gone Good Barkery Pup Butter Paw Balm, an all natural, food grade paw soother and protector, is specially formulated to heal rough, chapped, dry dog paw pads. Your dog loves to play and go for walks, loves the seasons and plays in the snow. Their paws can take a beating. 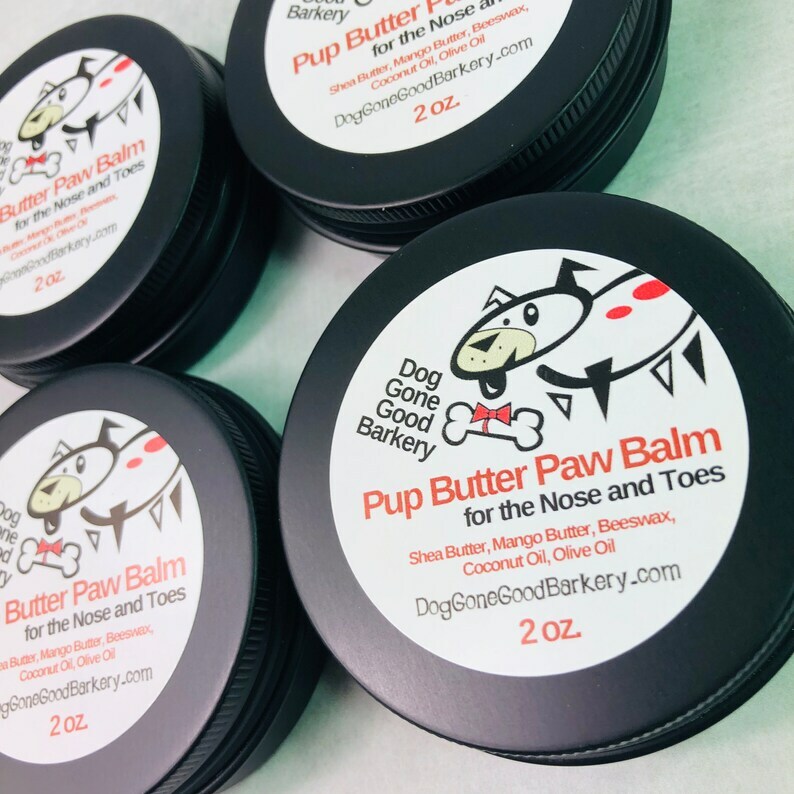 Their paws and noses sometimes need extra love and Dog Gone Good Barkery Pup Butter is here to help! Keep your furry friend's paw pads conditioned and your dog happy. Dry, cracking paw pads can cause discomfort to your dog. This balm can be applied liberally as needed for prevention or treatment of dry paw pads and noses. For no-mess application, simply uncap the product, twist up from the bottom, and glide the soothing Pup Butter directly over your dog’s paw pads or nose. It can also be used to help heal cuts, abrasions, hot spots and rashes. Pup Butter is so amazing and in a bind, it can be used on human paws, too! Dog Gone Good Barkery Pup Butter is made with safe ingredients for your dog. We all know how dogs love to lick and when and if they ingest the Pup Butter, no worries! Pup Butter is completely safe and good for them. What's in your Dog Gone Good Barkery Pup Butter? ~ Beeswax is healing for pup's paws. ~ Coconut oil has antioxidant properties and it helps in the absorption of other minerals. ~ Shea butter provides an effective barrier against damage caused hot surfaces and cold weather. The moisture provided by Shea Butter allows dry skin to heal and retain its elasticity. ~ Mango butter is rich in vitamins A, C, and E and contains high quantities of fatty acids. The vitamins help to immediately combat free radicals in the skin, which can cause dryness, cracking, and other problems, especially for dogs and their paws. ~ Olive oil is rich in a number of antioxidants and is one of those ingredients that can make a world of difference for any dog that’s dealing with dry, itchy or painful paws. Apply the Pup Butter before and / or after walks and outdoor play. Rub in and give your best furry friend some lovin' and a Dog Gone Good Barkery treat!